Squirrels are wonderful creatures. They’re fun to watch as they run and play and steal all of the birdseed out of feeders. Wait. No, that part isn’t quite as good as the rest, is it? Luckily, there are a few different ways you can enjoy the squirrels while also preserving your birdseed for the birds. We’ve reviewed the top 4 bird feeder pole designs from Squirrel Stopper and GrayBunny. Two of them have built-in squirrel prevention while the other two will need a little something extra to make them valid squirrel proof bird feeder pole options. We’ve rated each of the models for effectiveness, functionality, ease of installation, durability, style, and price. We’ll tell you how to care for your bird feeder poles and how to make them more effective, all while being kind to your backyard squirrel population . 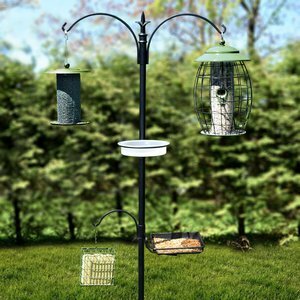 The Squirrel Stopper squirrel proof bird feeder pole and baffle is an eminently useful product with a high capacity for feeders. The spring-loaded, rotating baffle in the middle of the pole prevents squirrels from getting a grip and scaling the pole. It’s a lot of fun to watch them try climbing a surface that moves as soon as they touch it. It doesn’t hurt them in any way. It’s entertaining. The baffle is also high enough up the pole that they can’t jump past it. You can install the Squirrel Stopper bird feeder pole with fast assembly and a built-in auger to help you twist it into the ground. Once set, you will want to coat it with your own rust preventative, such as a Rust-Oleum clear coat spray. The black steel itself is very thick (16 gauge) and durable. As long as you coat it, and reapply the rust preventative as needed, the Squirrel Stopper will be a long-standing ornament for your yard. 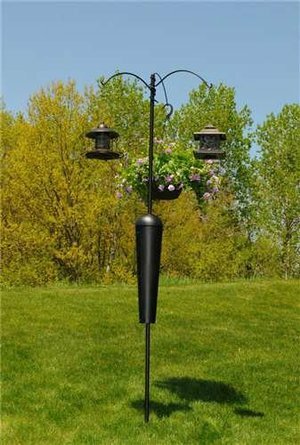 The black finish and shapely design help this bird feeder pole stand out as an attractive addition to any patio or yard space. It will also stand tall at about 8 feet from the ground to the top. And speaking of the top, the steel cutout bird and leaf at the apex of the pole make it an especially appealing piece of décor. You can hang 4-6 bird feeders at varying heights on the four arms of the bird feeder. Hang bird feeders filled with different mixes or suet to attract a variety of birds to your pole. You could also hang flower baskets or wind chimes from the arms for a complete ensemble. Keep in mind, though that you’ll need to pay attention to weight if you’re merely twisting the pole into the ground. Balance each side of the arms with an approximately equal distribution of pressure to keep the pole from leaning to one side. You could also sink the pole in a concrete footer for extra stability. The Squirrel Stopper bird feeder pole is an expensive piece of equipment. The payoff, however, is the amount you’ll save on bird food. Squirrels eat a lot of seed, and waste even more hijacking birdfeeders and scattering seed on the ground. Depending on how many feeders you use, you could recoup your investment on the pole in less than one season. The Squirrel Stopper is indeed a squirrel proof bird feeder pole that you’ll be able to enjoy for many years with the proper care. With another product from Squirrel Stopped, the Shenandoah does what it says with the same movable, spring-loaded baffle system but with a different look on top. The improvement on this design is that they’ve included a rust-preventative, so you won’t need to coat the pole yourself. The bird feeder pole itself, however, is thinner than the above model (1.25 inches compared to 2 inches in diameter), so you’ll want to use this pole for lighter feeders. It still comes with the built-in auger to help you screw it into the ground, and assembly is equally as comfortable. The main difference is the design of the arms. With three arched arms instead of four straight ones, you can hang more extensive feeders or hanging baskets from each hook. You will need to balance each arm, though, to keep the pole from leaning. This squirrel proof bird feeder is less expensive than the above counterpart, but you will need to adjust or replace the rubber ring in the baffle once a year or more. Squirrels are tenacious creatures and will slowly chew away at any component that isn’t metal. In this case, it’s the rubber ring. Once they chew through that, they can climb up the pole without any problems. As for design appeal, it’s up to which looks better. Do you like the arched arms and more subtle charm of the Shenandoah or do you appreciate the steel bird cutout of the thicker model above? Dropping in price and dropping the baffle is the GrayBunny Shepherd Hook. It’s a simple, subtle way to hang your bird feeders for less. Note, however, that this is not a squirrel proof bird feeder pole until you modify it. We’ll tell you how to do that in the Tips section below. The GrayBunny Shepherd Hook stands 80 inches once installed and is made of solid steel less than half an inch thick. So though tall, it is very skinny and firm. You can hang heavy bird feeders or baskets from the hook without worrying about the arm or pole bending. It will also blend in with the rest of your yard because of its small diameter. The coating is rust-resistant, and the GrayBunny Shepherd Hook comes with a lifetime guarantee. 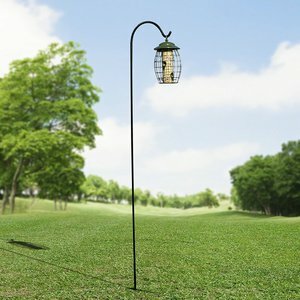 You can install it easily by merely stepping on the forked prong, and you’ll never need to do any maintenance on this bird feeder pole. Set it and leave it or move it where you want with easy staking. On the downside, you can only hang one bird feeder from this pole, so if you want to attract certain types of birds specifically, you’ll need more than one pole. We like the GrayBunny Shepherd Hook bird feeder pole for its subtle appearance and durability. It comes for less than $30, and you can turn it into a squirrel proof bird feeder pole reasonably easily. The GrayBunny Premium Bird Feeding Station is indeed a step up from the Shepherd Hook for less money. You can arrange each of the hooks and dish holder hardware anywhere along the pole in any direction you want. Keep in mind that you will need to balance the weight on the hooks and the directions they face to keep the pole stable. 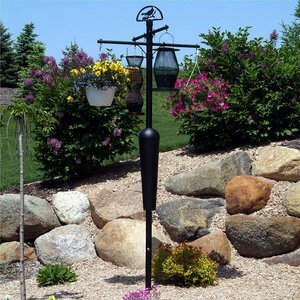 The bird feeder pole sinks into the ground with the same forked prong as the above model. Unfortunately, the pole comes in hollow sections rather than being solid steel like the Shepherd Hook. You can still hang heavier items from the hooks, but it won’t be as durable as the above option. In fact, the company only offers a 30-day warranty on this product compared to the lifetime guarantee on the Shepherd Hook bird feeder pole. It does still come with a rust preventative coating to help it stand up to the rain and snow with no discoloration or damage. It is more attractive and robust than the Shepherd Hook with multiple arms and two trays. You can fill the trays with dried fruit, berries, or water. Use the hooks for bird feeders, hanging baskets, or wind chimes. You can also remove any of the hooks or tray holders if you don’t use them. We like the GrayBunny Feeding Station for its versatility and low price. See below for Tips on how you can transform it into a squirrel proof bird feeder pole. Rust prevention. Whether you’re buying a GrayBunny Shepherd Hook or a Squirrel Stopper Bird Feeder Pole, you will want to spray it with a rust preventative sooner or later. Every one of these models (except the first) comes with a rust-resistant coating. They will resist rust; they won’t wholly prevent it. Spray each one with a Rust-Oleum clear coat once a year to maintain their sleek, black, finishes. Spray the Squirrel Stopper Bird Feeder Pole as soon as you install it. Placement. Squirrels are jumpers. When they’re hungry, they will jump off your roof or off of branches onto your bird feeders. Even a bird feeder pole with a baffle won’t prevent that. For the best results, place your poles 12 feet away from any trees, fences, or structures that a squirrel might climb on. Sink your poles. If you want to ensure that your bird feeder pole is going to stay upright in the wind and be able to hold anything you hang from it, set it in concrete! Dig a 1-foot diameter post hole, pour your concrete, and set the bird feeder pole down in it. Use a level to make sure that the mast is straight as the cement dries. You could pour gravel around the pole in the hole for a slightly less effective result. Add a baffle. If you’re buying a bird feeder pole without a baffle, you can add one on yourself with an aftermarket baffle. They won’t be spring-loaded like the Squirrel Stopper patented design, but they will wobble, preventing squirrels from climbing up them easily. You can install a domed baffle at the bottom of the pole to block them from climbing up, and a baffle above the feeder to prevent them dropping down. Grease your pole. If your baffle breaks or you don’t want to use a baffle but still want a squirrel proof bird feeder pole, you can make the pole too slick for a squirrel to climb. Coat the mast once a week in vegetable oil. It’s an excellent rust preventative and will keep the pole oiled up for those grabby squirrel paws. Don’t forget the squirrels! Squirrels are only a pest when they get into things they shouldn’t. Otherwise, they’re very lively, entertaining, adorable creatures to watch. Once you’ve solved the problem of squirrels getting into your birdseed, consider giving them their own squirrel feeders . You’ll enrich the wildlife of your backyard while providing the proper feeders for each type of animal. The Squirrel Stopper and SS Shenandoah are the most effective designs at preventing squirrels from stealing your birdseed. They’re both lovely and would make substantial additions to your backyard. They are on the more expensive side of bird feeder pole designs. The GrayBunny Shepherd Hook and Premium Bird Feeding Station are less expensive but do not come with squirrel prevention. You can purchase other baffles for the poles or grease them to turn them into viable squirrel proof bird feeder pole options. With any design you purchase, remember to spray it with a rust preventative once a year and set it a foot away from anything a squirrel could use to jump down from. Set your poles in concrete or gravel for added stability. And... don’t forget to feed the squirrels!